Can’t remember your password for a PDF document or download some encrypted PDF files? 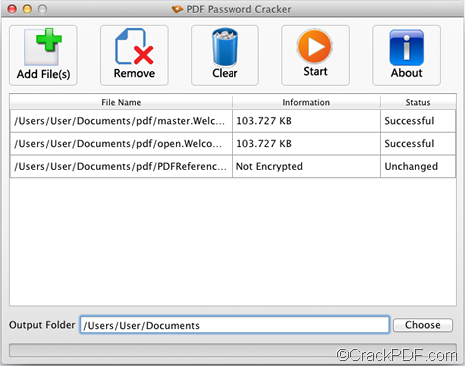 The application CrackPDF PDF Password Cracker for Mac will do you a great favor. There two types of PDF passwords: owner password and user password. *Owner Password: also named master password, can protect PDF files from editing, copying and printing. *User Password: also called open password sometimes, can protect PDF documents from opening. 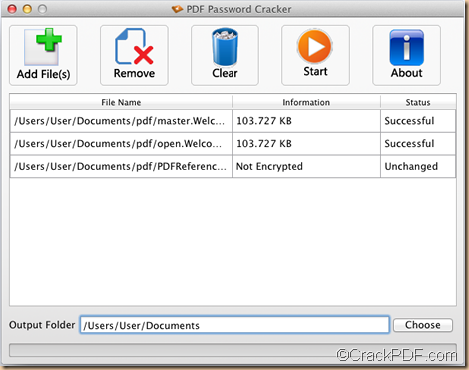 What is CrackPDF PDF Password Cracker for Mac? PDF Password Cracker for Mac is a small yet powerful PDF decryption tool on Mac OS X v 10.5, 10.6, 10.7, etc. It enables Mac users to crack password and remove copying and printing restrictions from secured PDF documents. 1. Please download CrackPDF PDF Password Cracker for Mac and install the application, and then you will see it in the Applications folder. Then please run it. The following is a snapshot of the main interface. 2. In the tool bar on the main interface, please click the Add File(s) button to open the file picker window. Then, please choose the password protected PDF files. 3. Start to crack passwords for the PDF files. For PDF files protected by owner password, the software can crack the owner passwords directly and create decrypted PDF without entering the password. For PDF documents protected by only user password, you need to type the correct user password in the pop-up “Input Password” window and click the OK button on the window. Then, the application will crack the user password. For PDF files encrypted by both owner password and user password, you also need to input the right user password in the pop-up “Input Password” dialog box and click the OK button on the dialog box. After that, the software will crack both the user password and the owner password. By following the above instructions, you can easily crack the PDF password on your Mac. To learn more information about this PDF decryption application or purchase it online, please visit the homepage of CrackPDF PDF Password Cracker for Mac. To try this application for free, please click the following button. How to crack forgotten Word password? Wanna retrieve forgotten Microsoft Word password? Have you been required to enter the password when you open a password protected Word document you need urgently? If this situation sounds familiar to you, you don’t need to desperately try dozens of password variants to guess the correct one now. 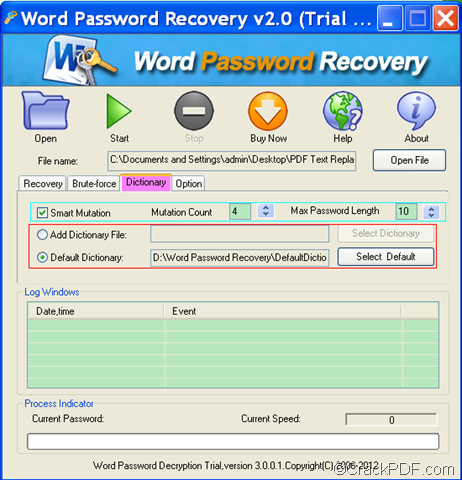 Thanks to CrackPDF Word Password Recovery, you can easily restores MS Word password. It is a simple utility that supports recovery of all types of passwords MS Word has: a password to open a document, a password to modify a document, etc. CrackPDF Word Password Recovery provides three password recovery modes: Dictionary Attack, Brute-force with Mask Attack and Brute-force with Mask Attack (Trying All Combinations). In the following, it will show you how to adopt Dictionary Attack to recover Word password. 1.Download the installer of CrackPDF Word Password Recovery, then install it on the computer by following the setup wizard. It will automatically run after you successfully install it. And you can quick launch it by directly double clicking the icon of this application next time. 2. Input the encrypted Word file into the application. Click Open or Open File to open the “Open File” dialog box, then browse and select the Word file you want to unlock. The directory of the file will be displayed in the “File name” edit box. You can choose to try combinations among the passwords in dictionary. Click Mutation Count and specify 2,3 or 4 in the “Mutation Count” combo box to try combinations among the passwords in dictionary. For example, if you choose 4 in the “Mutation Count” combo box, it will try combinations between every three passwords in the dictionary after trying every password. You can also set the “Max Password Length”. You can choose the default dictionary built in the application or add a new dictionary. 4.Click Start to find the Word document password back. 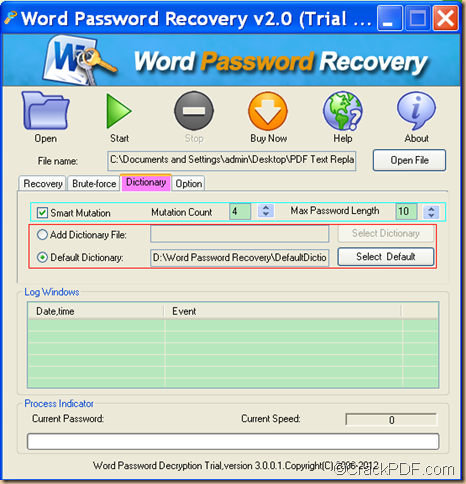 Then, CrackPDF Word Password Recovery will crack password of the Word documents automatically. You can click to try CrackPDF Word Password Recovery by yourself.